This allows you to customize your keyword reports with your company name, logo, web site URL embedded into the keyword reports. It is useful if you’re a PPC Manager or an Agency. To customize your keyword reports, simply enter your company details under the "Profile" section of the "Configuration" window. 1. Click the "File" menu item from the menu bar and choose "Configuration". 3. Enter all the details on the "Profile" tab and click OK.
1. 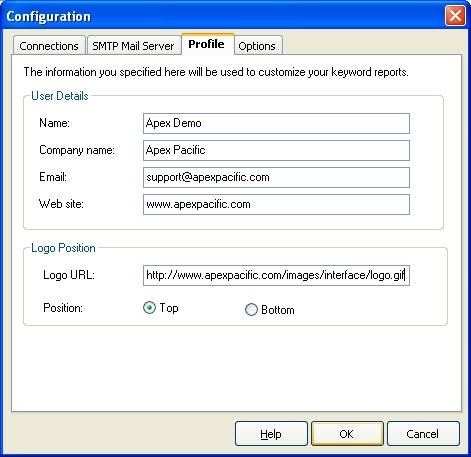 Double click on the Account name on the account selector tree on the left hand side of the screen. 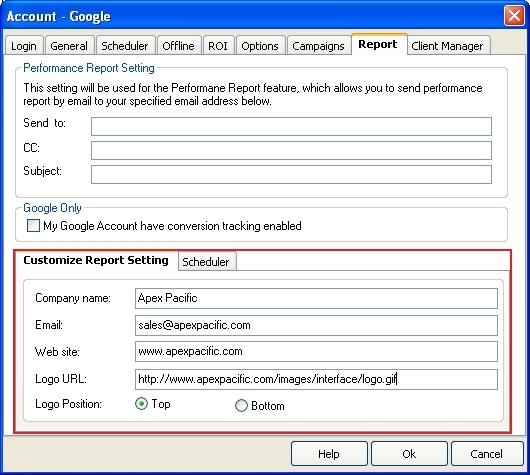 2. change the tab to "Report" and Enter the details under "Customized Report Setting" and click OK.